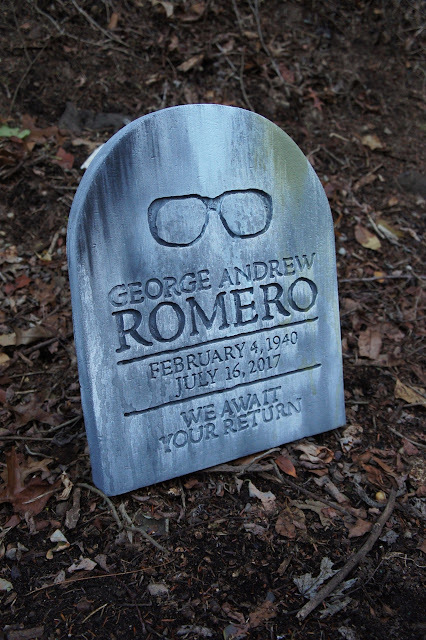 This past weekend, I was able to quickly whip up a small tombstone for George Romero, father of the modern zombie film. The rest of the epitaph was standard information with a tongue-in-cheek nod to his zombie films in the final line, "We Await Your Return." Get it? Zombies?? And as a final homage to his original zombie trilogy, I did a 3-color wash across the top of the stone. Black and white for Night, zombie flesh blue for Dawn, and military fatigue green for Day of the Dead. Something I'm sure no one would ever catch, but definitely a personal tribute to a director who influenced all things horror, and even Halloween, in my life. All total, this simple small stone took about 3 days to complete and will be a nice little hidden gem to discover. And, it will look great flanked by some of my larger, more ornate stones on Halloween night.